One of the oldest and largest temples in Bangkok features the famous Reclining Buddha, which is the largest in Thailand measuring more than 150 feet in length. We we're dropped by River Sun Cruise at River City Complex after our Ayutthaya city tour and cruise from Ayutthaya to Bangkok. From there we tried to negotiate with a few taxi drivers to take us to Wat Pho using taxi meter but emerge with negative results. They all wanted us to pay for fixed prices of 200 THB, another one agreed for 150 THB, however I wanted to take the taxi ride with the meter on. They reasoned out the heavy traffic on the way there because some of the areas we will pass through have ongoing protests. One taxi driver encourage us to take the boat to Wat Pho. I'm glad they won't force their service on you. It's okay if you take it or not. This is what I love about them. So yes, we decided to take the boat from Si Phraya Pier to Tha Thien Pier. Good thing I have previous knowledge of taking the boat ride before we went to Bangkok. Si Phraya Pier is located directly adjacent to Royal Orchid Sheraton Hotel (if you'd remember this is our meeting point for our River Sun Cruise earlier.) This is the direction from West to East facing the river. 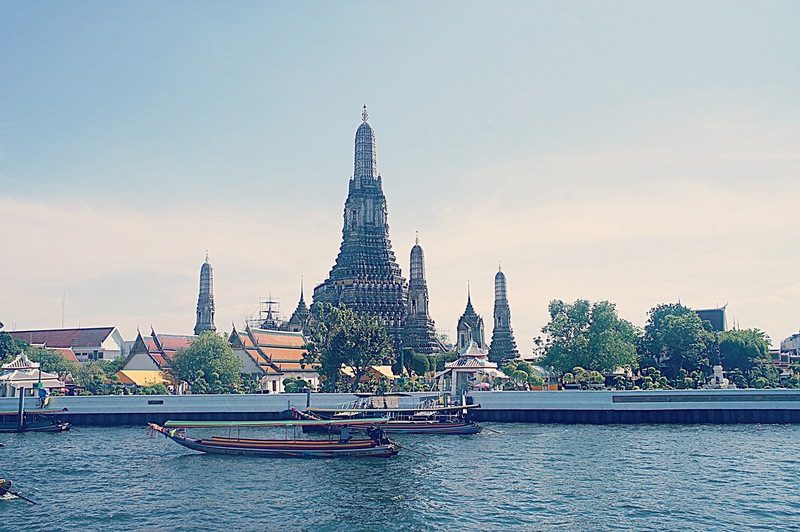 I was really amazed at how convenient it is to take the boat ride to Wat Pho. It's just like taking the train. You must know what station to stop. There are several piers at the side of the river each labeled with their assigned pier numbers. Example Si Phraya Pier is (N3) and we wanted to alight at Tha Thien which is labeled with (N8) because that's where Wat Pho is. If you wanted to go to other locations you must know where you will alight so that you can inform the ticket collector at the boat (you can also ask the lady at the pier counter or checked the map at the pier station). Our ride cost 40 THB each. Taking the boat is hassle free with no traffic. This is our last stop during our Bangkok trip. I was surprised that the area is not just a single temple containing the huge reclining buddha but instead it's a big temple complex with other temples and stupas around which I'll cover in my next post. To give you an idea of how big the area is here's a map. We entered the area through the east entrance. This is the entrance facing the river. Once you exit Tha Thien pier it would be easy for you to recognize Wat Pho. We paid 100 THB each for the entrance with free cold bottled water and free usage of their cover ups (in case you are wearing shorts and sleeveless) when going inside the temple of the reclining buddha. Here I am wearing a green cover up / robe provided. You'll also be asked to remove your footwear while inside the temple. But don't worry because they will also provide a bag for you to put in your footwear. 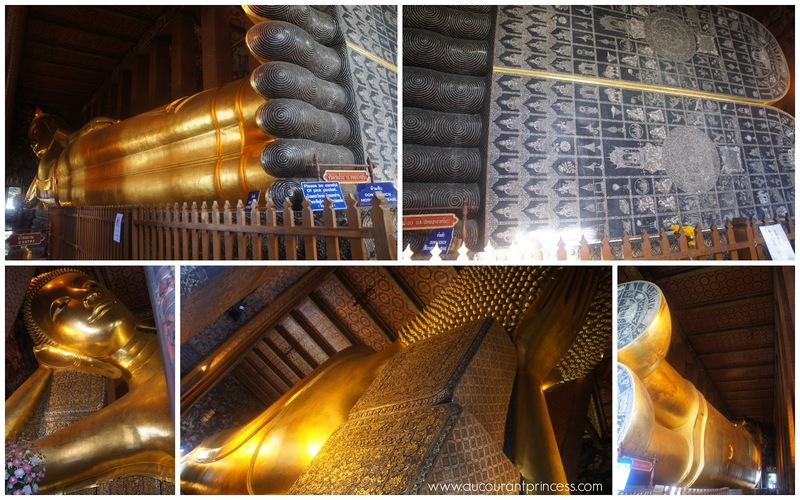 More photos of the Reclining Buddha at Wat Pho. Can you count the pillars supporting this temple? There are a few altars of buddha in different position in between the pillars. 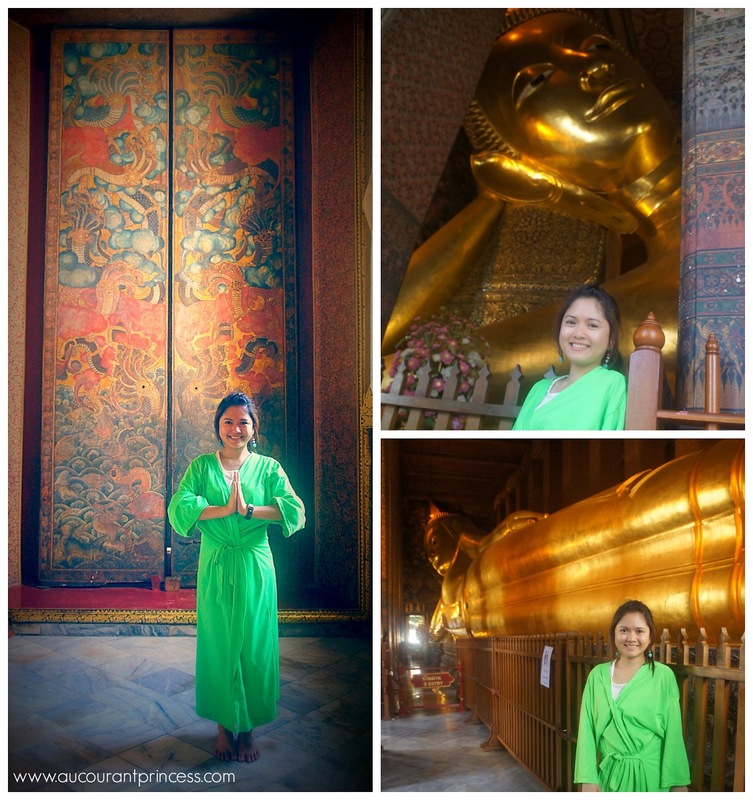 Here I've made a video from our visit at the Reclining Buddha Wat Pho. 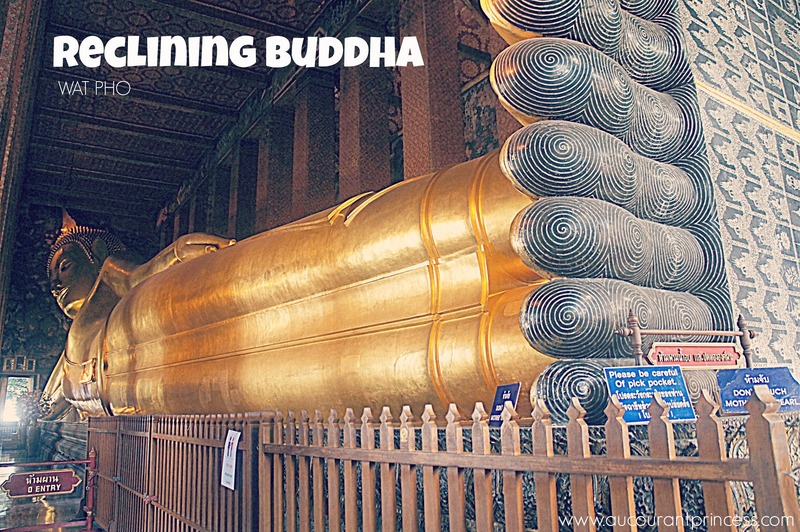 You might want to check it out to grasp how huge this reclining buddha is. What do you think? He's huge right?